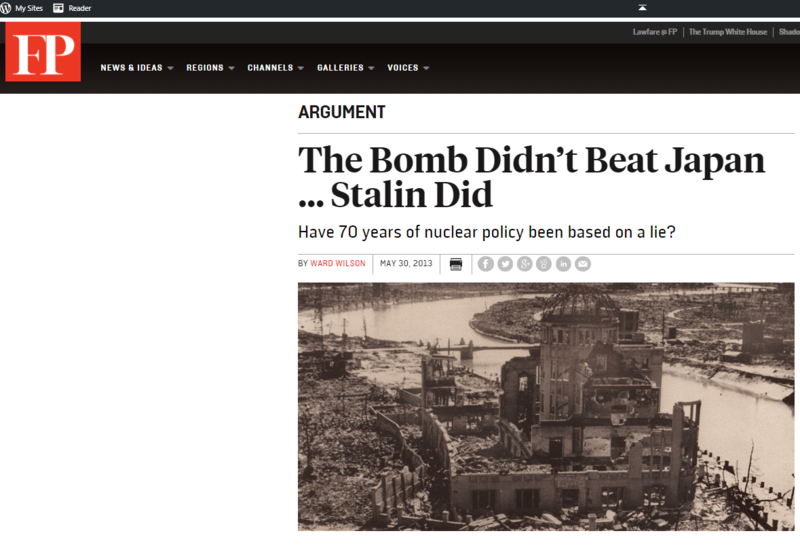 The leading US magazine Foreign Policy ​published an important article showing conclusively that it was the entry of the Soviet Union into the Pacific War that was the decisive event that caused Japan to surrender, not the atomic bomb. ​This fact has been known for a long time to serious historians. But its publication in a major article in a foreign policy magazine was a new step forward in the truth reaching a wider audience. As with the fact that it was the Soviet Union’s defeat of Nazi Germany at Moscow, Stalingrad and Kursk that crushed Nazi Germany, not D-Day which came when Hitler’s defeat was already inevitable, the truth about World War II against Japan is also gradually being admitted – even if it took 70 years to do it. ​It is strongly recommended to read the whole article crucial passages are below. ‘[Previously] Although the Supreme Council discussed the importance of the Soviet Union remaining neutral, they didn’t have a full-dress discussion about the impact of city bombing. In the records that have been preserved, city bombing doesn’t even get mentioned during Supreme Council discussions except on two occasions: once in passing in May 1945 and once during the wide-ranging discussion on the night of Aug. 9. Based on the evidence, it is difficult to make a case that Japan’s leaders thought that city bombing — compared to the other pressing matters involved in running a war — had much significance at all. ‘Gen. Anami on Aug. 13 remarked that the atomic bombings were no more menacing than the fire-bombing that Japan had endured for months. If Hiroshima and Nagasaki were no worse than the fire bombings, and if Japan’s leaders did not consider them important enough to discuss in depth, how can Hiroshima and Nagasaki have coerced them to surrender? ​’Once the Soviet Union had declared war, Stalin could no longer act as a mediator — he was now a belligerent. So the diplomatic option was wiped out by the Soviet move. The effect on the military situation was equally dramatic. Most of Japan’s best troops had been shifted to the southern part of the home islands. Japan’s military had correctly guessed that the likely first target of an American invasion would be the southernmost island of Kyushu. The once proud Kwangtung army in Manchuria, for example, was a shell of its former self because its best units had been shifted away to defend Japan itself. When the Russians invaded Manchuria, they sliced through what had once been an elite army and many Russian units only stopped when they ran out of gas. The Soviet 16th Army — 100,000 strong — launched an invasion of the southern half of Sakhalin Island. ‘Their orders were to mop up Japanese resistance there, and then — within 10 to 14 days — be prepared to invade Hokkaido, the northernmost of Japan’s home islands. The Japanese force tasked with defending Hokkaido, the 5th Area Army, was under strength at two divisions and two brigades, and was in fortified positions on the east side of the island. ‘The Soviet plan of attack called for an invasion of Hokkaido from the west. It didn’t take a military genius to see that, while it might be possible to fight a decisive battle against one great power invading from one direction, it would not be possible to fight off two great powers attacking from two different directions. The Soviet invasion invalidated the military’s decisive battle strategy, just as it invalidated the diplomatic strategy. At a single stroke, all of Japan’s options evaporated. The Soviet invasion was strategically decisive — it foreclosed both of Japan’s options — while the bombing of Hiroshima (which foreclosed neither) was not. ‘The Soviet declaration of war also changed the calculation of how much time was left for maneuver. Japanese intelligence was predicting that U.S. forces might not invade for months. Soviet forces, on the other hand, could be in Japan proper in as little as 10 days. The Soviet invasion made a decision on ending the war extremely time sensitive.